Rylee Mirabile volunteers at the Building One Community center in Stamford. Picture taken on Jan. 10, 2018. 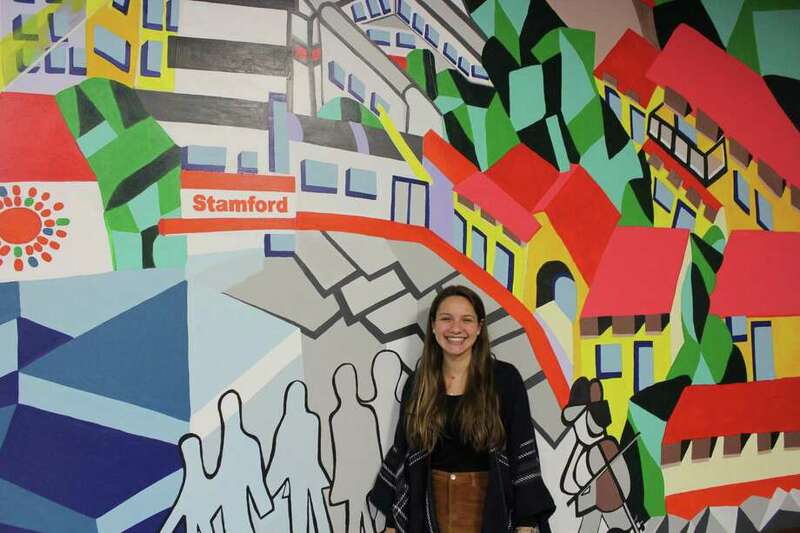 DARIEN — Rylee Mirabile, 16, has volunteered at Building One Community, an immigration help center formerly known as Neighbors Link Stamford, since her freshman year. Throughout her two years of volunteering, Mirabile, now a junior at Darien High School, has become a constant presence at the Stamford nonprofit; she is often seen playing cards with people three times her age and bringing her fellow classmates to volunteer. Q: How did you find Building One Community? A: Every other year, our high school has a volunteer fair and my freshman year I remember this one woman who had bright, blue hair. I was just drawn straight to her. I was looking to volunteer because I was getting bored doing nothing. I had really enjoyed my time in Spanish class and she and I clicked. I began volunteering the week after. Q: What were your first days as a volunteer like? A: I began with assessments. I used to do them with this guy, Christian, but he left some time ago. The assessments usually start with questions like ‘What time is it?’ and “Why do you want to learn English?” and three reading parts along with two writing section parts. We will also recite words to help with pronunciation. Q: How was your time engaging in Spanish? A: It took some time to get used to it because I was fine with Spanish speakers. With people who spoke other languages, however, like French, French Creole and Portuguese it was frustrating, but eventually I kind of figured it out. I’m still working on my Spanish. I’d say I’m on a medium to intermediate level in Spanish — I’ll give myself that. With Portuguese I would try speaking Spanish because the languages are not completely different. I did develop some French skills, along with a lot of hand motions, but I was able to pick up some key words in French. Q: How have things changed in the past two years that you’ve been here? A: The people have changed in that a lot of the people who I started out with in staff are no longer here — so the original group is no longer with me but there are just as good of people. There are certain people that I’ve done assessments with and I’ll catch up with them whenever I see them here at the center. A: I come here from 5 p.m. to 7 p.m. every Wednesday for assessments. The people I help will usually walk in before classes start but I’ll stay the full two hours to see if people show up. I greet everyone and will go play cards and talk to people. We also do puzzles. Some people will play pool but I don’t know how to play. Q: What do you enjoy most about volunteering? A: I really enjoy the assessments because I get to know people and their backgrounds. The assessments are basic questions and people get into it and tell me their stories. I become really interested in what they tell me and I get to know their backgrounds more. Q: How has been at Building One Community shaped your goals for after high school? A: I have an interest in either doing special needs education or studying international human rights law. Being here has definitely helped that. Before I knew I liked to help but I didn’t know how and now I have been focusing on what I want to do and it’s given me guidance for what I plan to do for the rest of my life. I take introduction to human rights through the University of Connecticut. We had to do a project presentation relating to the right to identity. In the Universal Declaration of Human Rights, there is no right to identity and we had to pick something so I chose Article 15, the right to a nationality. We produced a video with one of the people here at the center. She was born in Colombia and grew up in America and whenever she went back to Colombia she was perceived as American. It was a really interesting theme to grasp and learn about. Q: Talking about identity, have you noticed changes here at the center following the election and Donald Trump becoming president? A: It makes me really sad because I know these people, I have a connection with them and their background and I know how good these people are. Since the election, there have been less people at the center and it breaks my heart because I want to see everyone happy. I do feel for people going through all of this. I’ve had less people for assessments. I use to have 12 to 13 assessments in a two-hour time period and now I’m lucky if I have one, so it’s something that I’ve definitely noticed. Q: I heard a story about you going to the Mexican Consulate in New York City last year. Can you tell us more about that? A: I was bored one day and there weren’t a lot of people and I was talking to a Spanish teacher about the embassies and all of that. This was my sophomore year of high school. So, I emailed a bunch of Latin American consulates and two of them replied, one of them being the Mexican Consulate. They invited me to the consulate in New York City and so I decided to go. Michelle Saldivar, who works at Building One Community, accompanied me. I met with the consulate general and we had a conversation about immigration in the state, especially Fairfield County and how to help kids who are born here but are not citizens. I was so nervous. I didn’t expect a reply, it was an in-the-moment kind of thing. The conversation went on for about 45 minutes and though he wasn’t there for all of it, his assistant was very helpful. It was all in Spanish but I did understand some stuff. Michelle, on the train back, explained and we thought it was a very positive conversation. I think he was excited to see youth in the community interested about this.